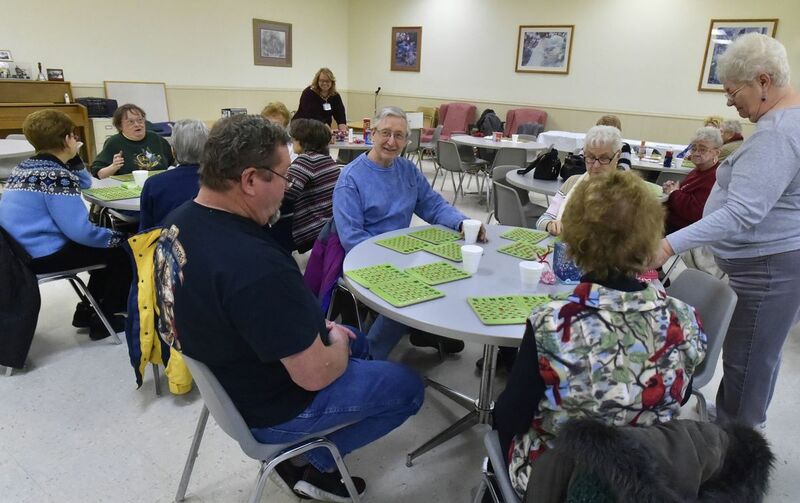 The new Burlington Senior Center opened Thursday in time for bingo, which is held on the second Thursday of the month. BURLINGTON — Our Harmony Club Assistant Director Christine Scott said that the first week she saw the inside of the former Knights of Columbus building, now the new Burlington Senior Center, she knew there was a lot of work to be done. Fortunately, the center had a lot of volunteers to undertake the project. This week, the new facility at 587 E. State St., opened to the public. Burlington Senior Center Board President Kevin Brierly and General Manager Pat Kendall said after the pipes froze at the Western Racine County Service Center building, 209 N. Main St., after New Year’s, volunteers of all ages pitched in some elbow grease to help get the Knights of Columbus building in shape. New ceiling panels were donated and installed, plumbing and electricity had to be updated and every wall was given a fresh coat of paint. Brierly said one 93-year-old donated hours of her time painting the walls. “Since she couldn’t play cards, she thought she’d come on down,” he said. This week at the new facility kicked off with Chocolate City Card Club, which had about 20 members come in Tuesday. Bingo, held on the second Thursday of the month, also drew a pretty good crowd. Kendall said they have received quite a few comments about how nice the new space is. Brierly said that the location, access and parking are also a big improvement.